Today was my expedition up the coast to stock up on supplies and sundries. It rained and hailed but I made it through just fine. Tomorrow we are supposed to get a nice winter storm and I will be snug in the studio painting. 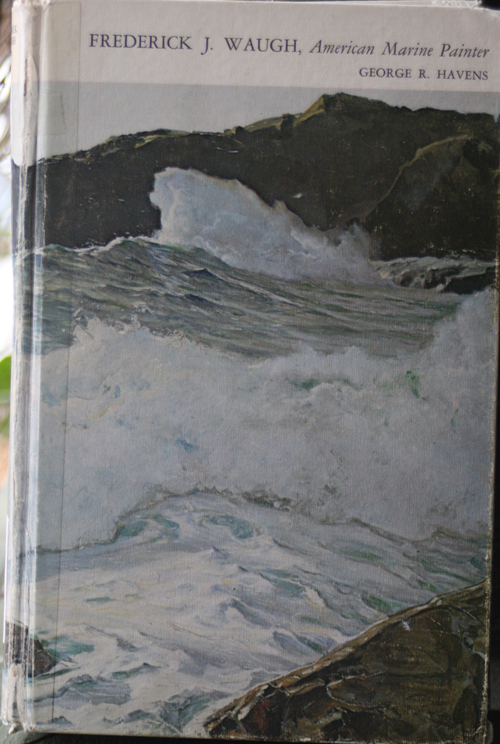 Tonight I thought I would post a brief book report on Frederick J. Waugh-American Marine Painter. I have read other's comments on the book and it seems to me that most seem to not think much of the content and style of writing. I would be interested to know why. The book was written in 1969 and based on interviews of the son and daughter of Waugh as well as written and anecdotal information from friends and associates. The language and tone of the book is from a more formal era than that of books we read today. I rather liked it. It seemed to be in keeping with what apparently was Waugh's character. Most of the book mainly focuses on his marine painting career which basically began when he was first married and had moved with his bride to the Isle of Sark. The book also discusses his childhood and artistic training. Frederick Waugh apparently wasn't a temperamental or "colorful" artist instead he was a well trained, hard working, and enthusiastic artist. He and his family are portrayed as loving and supportive. I found the biography interesting and informative. It gives a pretty good idea about what it takes to be an artist of that caliber. I was surprised to see how some of the economic and political challenges he faced are similar to what many artists face today. In between all the biographical information would be the occasional quote or observation on his working methods. The final chapter before the conclusion also contains a summary of his unpublished manuscript on his methods of painting the sea. Oh how I wish someone would unearth them if possible and print them up (preferably in an e-book! ).